There`s a restaurant in New Orleans – which is not just “a” restaurant – Tujagues is the city’s second oldest restaurant (after Antoine’s) and may be in jeopardy of closing. Please, please, please don’t close Tujague’s…. Here`s the story and here. I think it would be a catastrophe and very very sad if this old New Orleans landmark would be replaced with yet another “I got drunk on Bourbon” type of tacky tourist t-shirt shop.. Please see below my letter to Stanford Latter. This is such a potential tragedy that I have written the following letter and would like to ask for your help sharing it with your audience and helping me appeal to Stanford Latter. Let me start by saying how sorry I am about the recent loss of your brother, Steve. In the time I got to know him through my work with Tales of the Cocktail and the New Orleans Cocktail Tour two things always stood out– his dry wit and his love for New Orleans. He clearly had a deep respect for the history and culture of our great city with the way he ran Tujague’s for more than 30 years. Now, I don’t claim to be a real estate expert so I can’t speak to getting the most out of your investment. But as the founder of New Orleans Culinary and Cocktail Preservation Society, I do know about our city’s rich history of dining and drinks. Tujaque’s is the place that continued the legacy of Madame Begue’s legendary brunches and where the Grasshopper cocktail was invented. It’s the home of brisket and horseradish and the beautiful long standup bar that takes you back in time when you order a drink. It breaks my heart to picture the doorway of this landmark littered with Drunk 1 and Drunk 2 t-shirts. This city is in the midst of a renaissance– one that’s met with both excitement and fear. Every day brings progress that New Orleans hasn’t seen in decades. But the great fear, one that’s generations old, is that with progress comes a cleansing of the culture that makes this place not a just a great place to visit but, more importantly, a great place to live. Culture doesn’t just disappear in a day. Here one day, gone tomorrow. It erodes slowly as people put the bottom line ahead of everything else. But it doesn’t have to be that way. With what you choose to do with the Tujague’s building, you can stand for the peaceful coexistence between progress and culture. I know business is business. But sometimes selling to the highest bidder comes with costs that can’t be counted in dollars and cents. Like losing yet another of our beloved restaurants and a piece of the living history that makes New Orleans so special. If you sell the Tujague’s building to the wrong person, the rest of us will be the ones paying for it. So please, Mr. Latter, respect our history, respect our culture and respect the legacy your brother worked his life to build. New Orleans original stand-up bar. Built in 1827 on site of old Spanish Armory. Beginning around 1856, this locations was Madam Begue’s, famous for her 3-hour meals, later called “brunch” became Tujague’s sometime after WWI. In the 1800’s, New Orleans started drinking early – bar opened at 5:00 am – did brisk before-work business. During Prohibition, Tujaque’s waiters carried contraband bottles in their aprons. During Prohibition, Federal Agent Isadore Einstein came to New Orleans to test how easily liquor was accessible. Einstein stepped off the train in New Orleans and got a drink in 37 seconds! 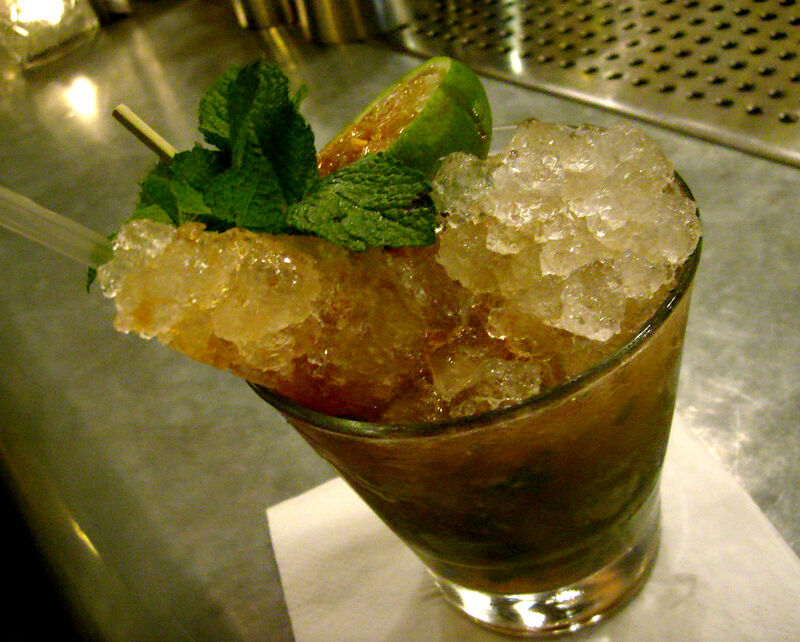 Famous for the Grasshopper which was invented by a bartender there who entered a competition! GRASSHOPPER: Equal parts of crème de menthe, crème de cacao and light cream or milk. Shake with ice and strain. 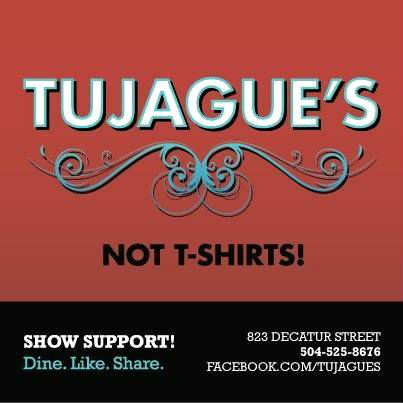 You can help by sharing the open letter and support Tujague´s! Let it flow, let it flow, let it flow! 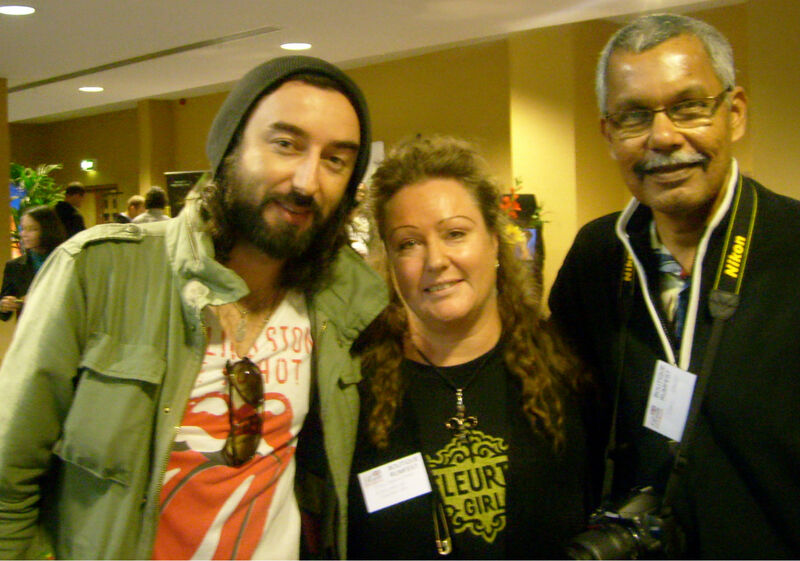 and flowed it did…rum here, rum there, rum everywhere – the UK Rumfest & Cane Spirits Festival is heaven for rum lovers and it shows people that rum is more than a spirit – it´s a lifestyle with a whole culture surrounding it. 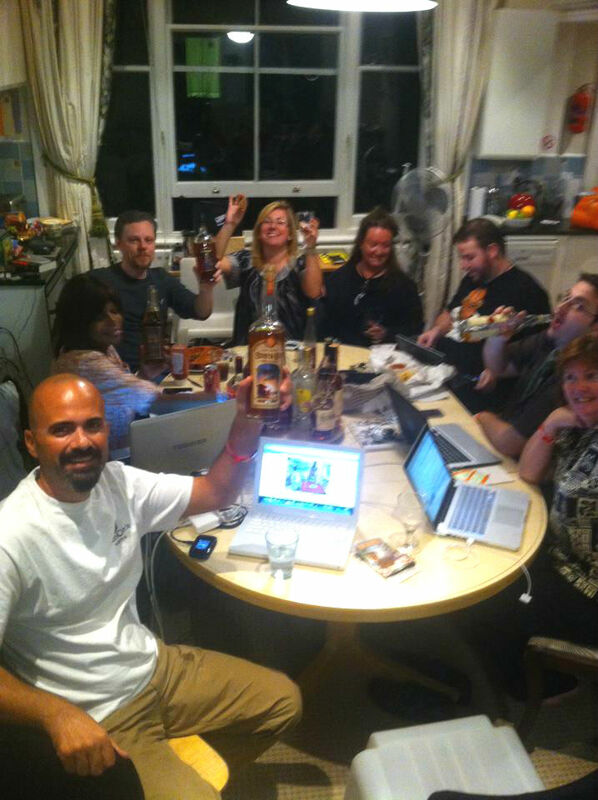 The UK RumFest brings together the industry’s plethora of blenders, distillers, bartenders and mixologists, writers, bloggers, brand ambassadors, rum enthusiasts – all joining in to celebrate all things rum. Here you get a chance to try out both new and old, known and unknown rums and many cocktails , tiki drinks and rum punches of course, (oh the rum punches…) listen to sessions, dance with tropical dancers, taste caribbean food, watch bartender competitions – all to the rhythms of the caribbean and in the company of people who have that one thing in common – they all love rum! 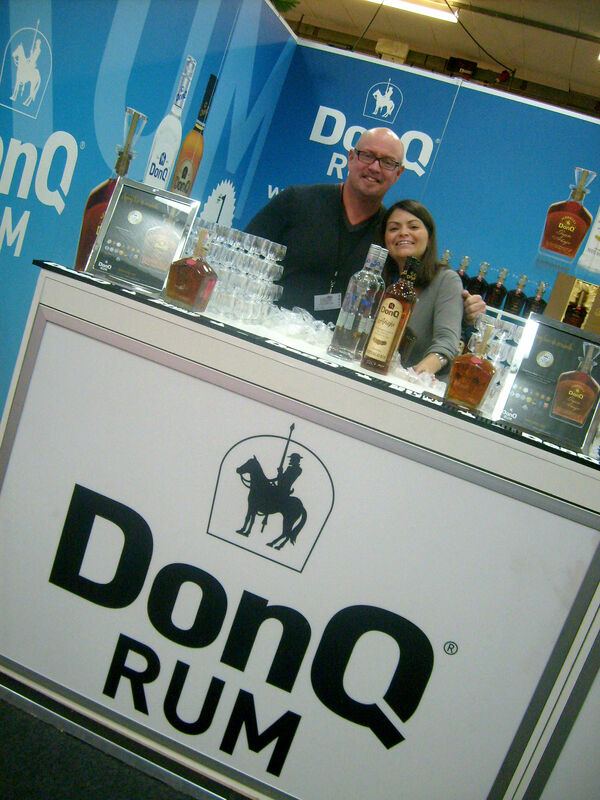 The UK Rumfest 2011 took place from friday to sunday oct 14-16 at the Kensington’s Olympia in London with the friday reserved for the Boutique Rumfest (for the trade with tastings and sessions.) 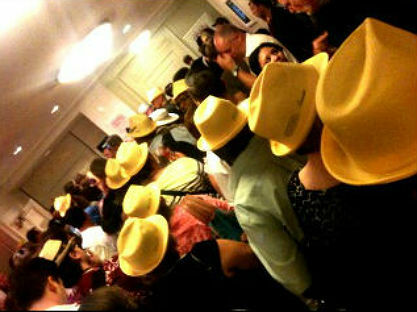 Saturday was the official Rumfest starting day and i don´t think i´ve seen a crazier crowd before when it comes to a room being packed with rum-lovers. But back to the friday and Boutique Rumfest. 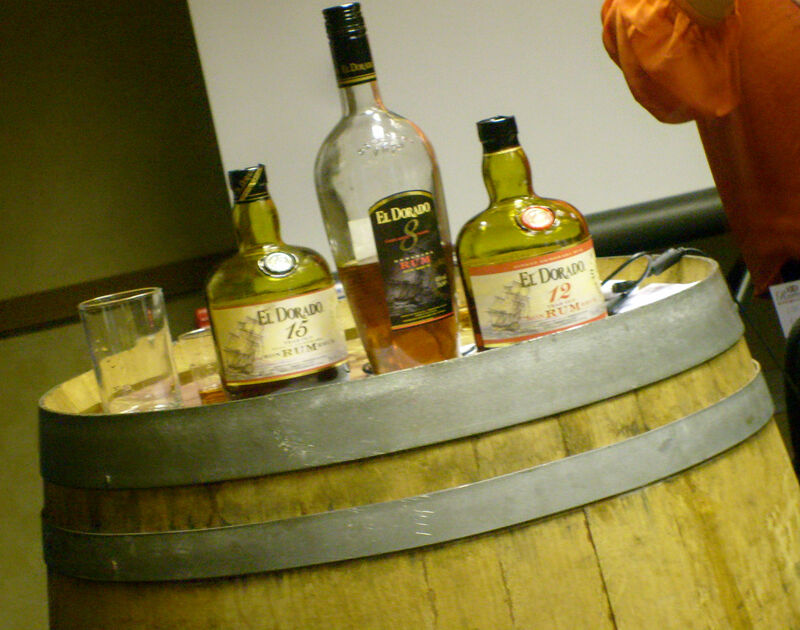 There was of course lots of rum to be tasted and since it was a calmer event we also got a much better chance to meet and talk to the producers about their products. 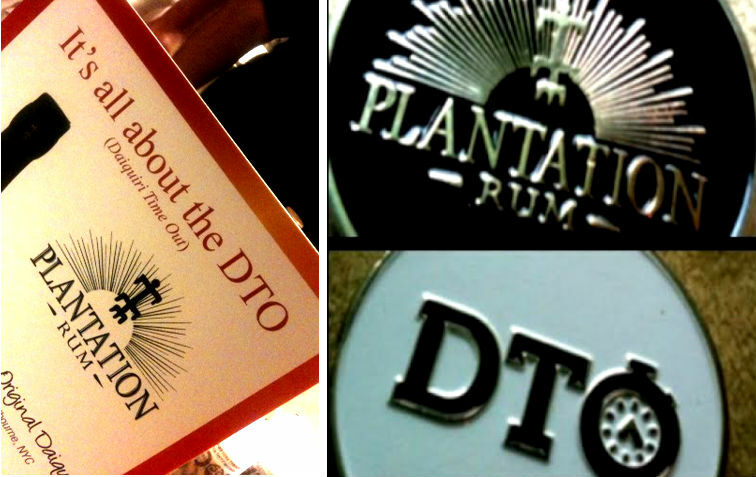 There´s an incredible amount of rums to be tasted, especially on the two official rumfest days, and i wasn´t able to taste it all i´m sure! i think there was over 400 different rums from well known brands like Zacapa, Foursquare, Bacardi, Havana Club, Appleton, Cockspur, Mount Gay, Chairman´s Reserve etc to smaller unknown brands like Les Coliniéres. 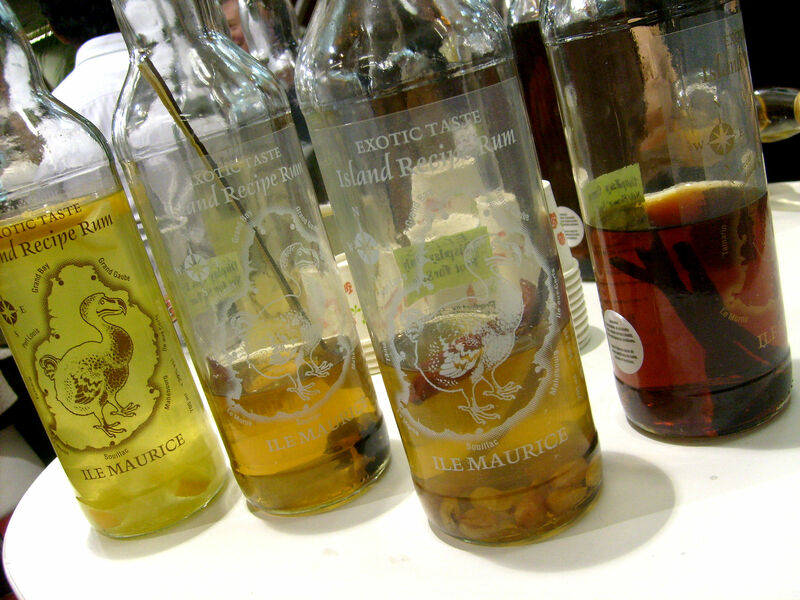 And Les Colinières – from Mauritius – naturally infused, so called “rum/rhum arrangé” in the islands of Mauritius and La Réuinion. 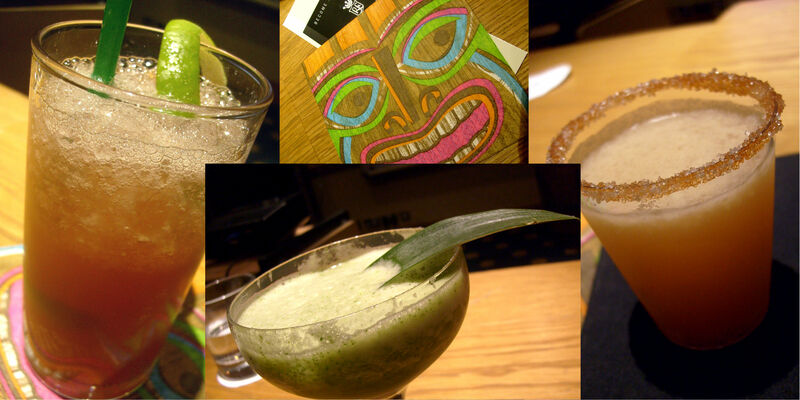 Their coffee and passionfruit rums were just amazing! and would be perfect in tiki drinks. 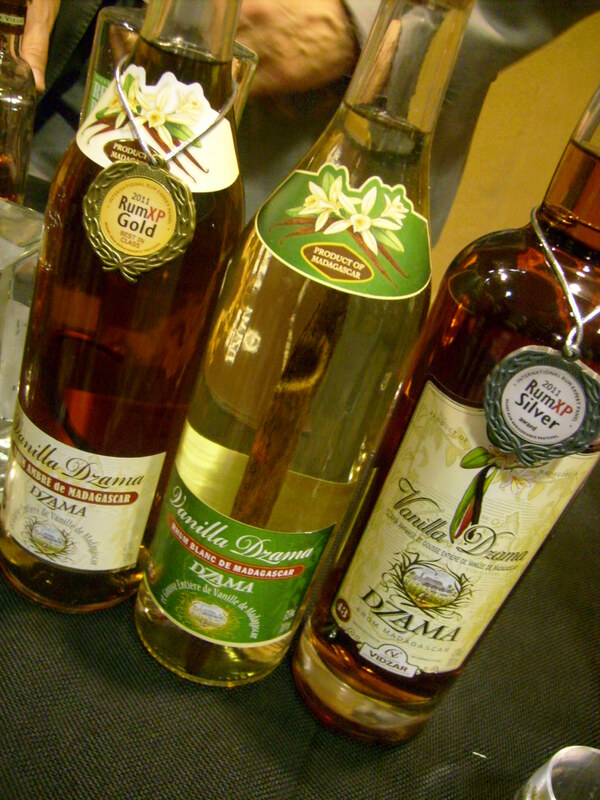 As far as i know their rums is not yet sold outside of Mauritius..
Also Rumfire was new to me. That is a Jamaican overproof white rum from the Hampden Estate which in Jamaica is known for its full, intensely flavorful pot still rums sold in bulk. 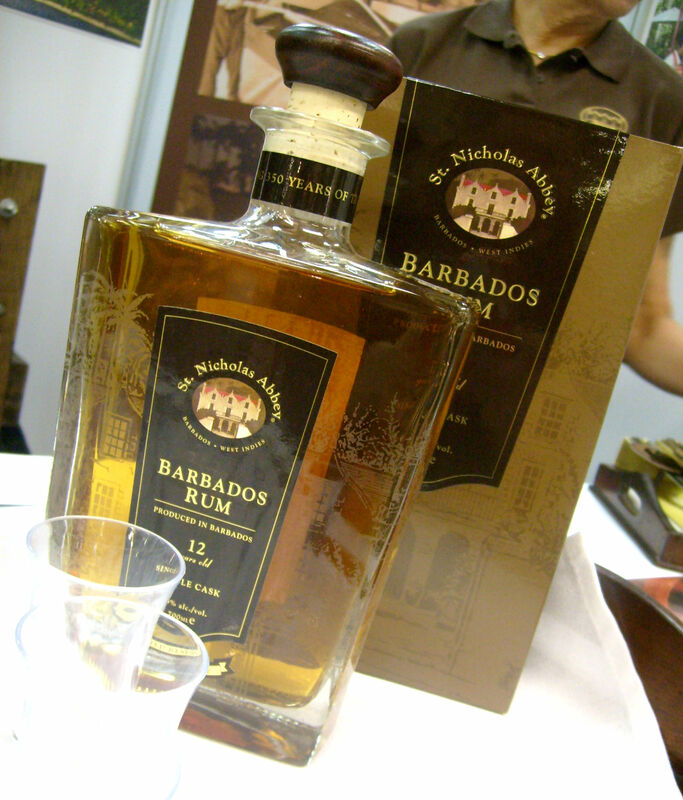 Today`s Rumfire that now is released to the public is yesterday´s JB rum which was on the black market. 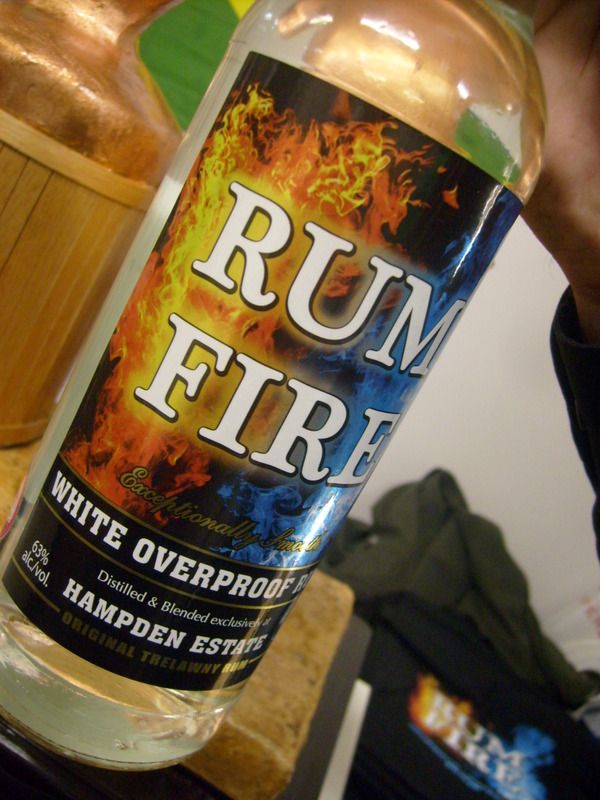 The Rumfire is like a smoother version of JWray overproof, it has hints of that flavor but it`s not as upfront. 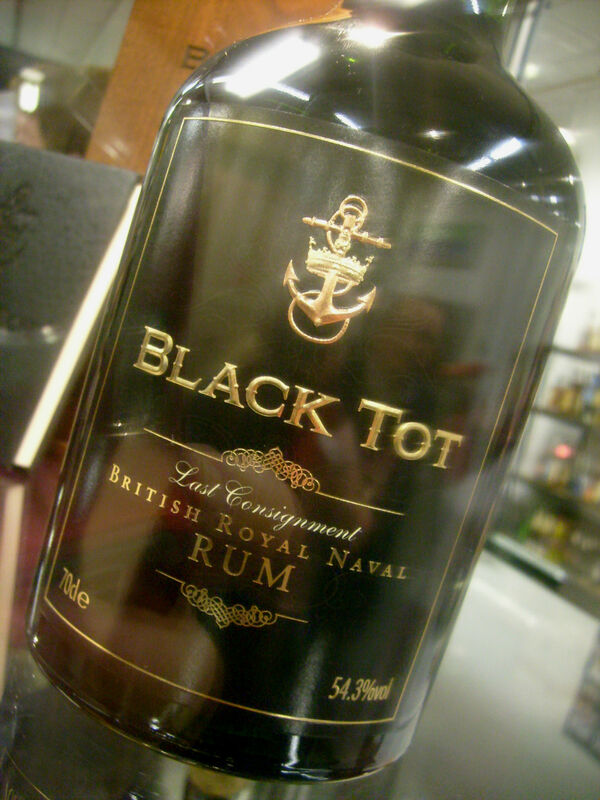 A very interesting and tasty rum. They made me a daiquiri with it and that was a nice daiquiri indeed, this rum mixes wonderfully. 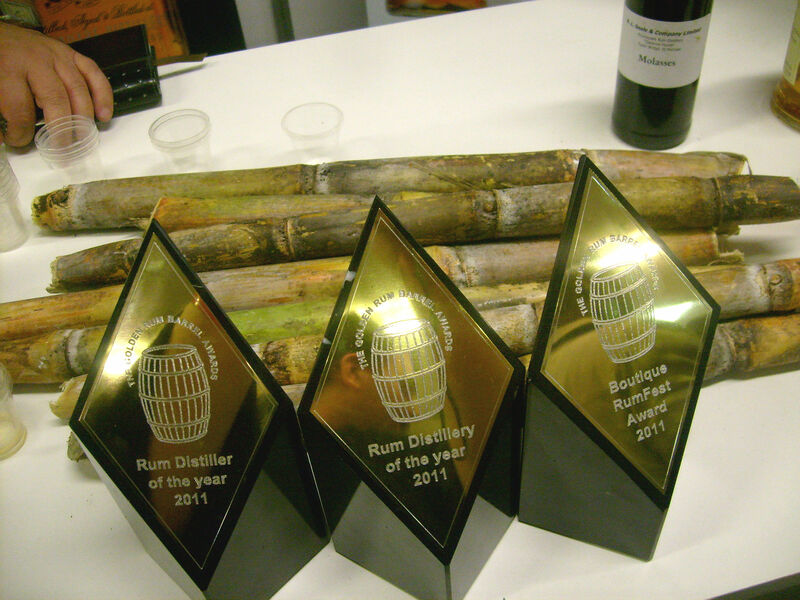 Also it won silver medal at the Ministry of Rum Tasting competition this year. Interesting but a bit odd was the Madagascar rum Dzama, it was quite good i think but i couldn´t be friends with the aftertaste which is what i found to be odd…so i have mixed feelings about this rum. 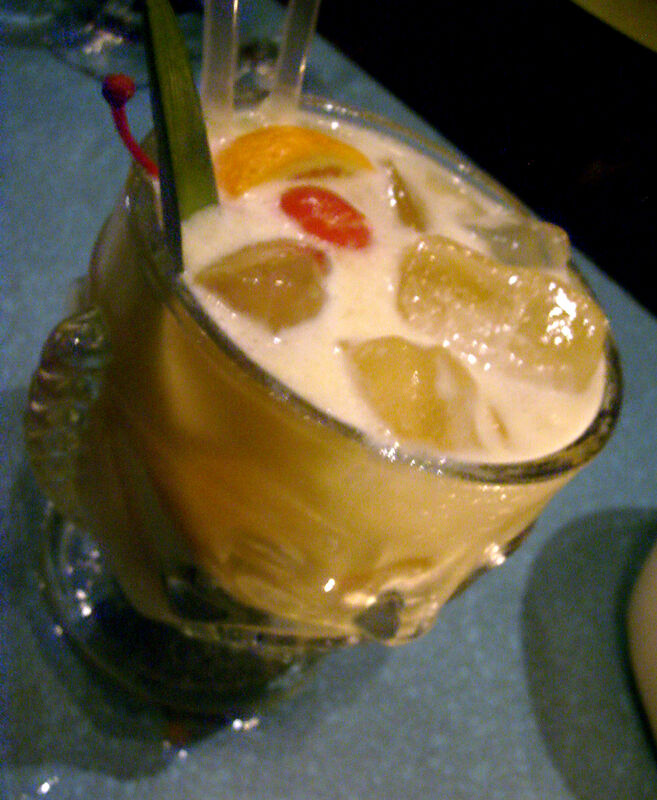 An exotic bird…i wouldn´t mind taste the rums again and take more time. 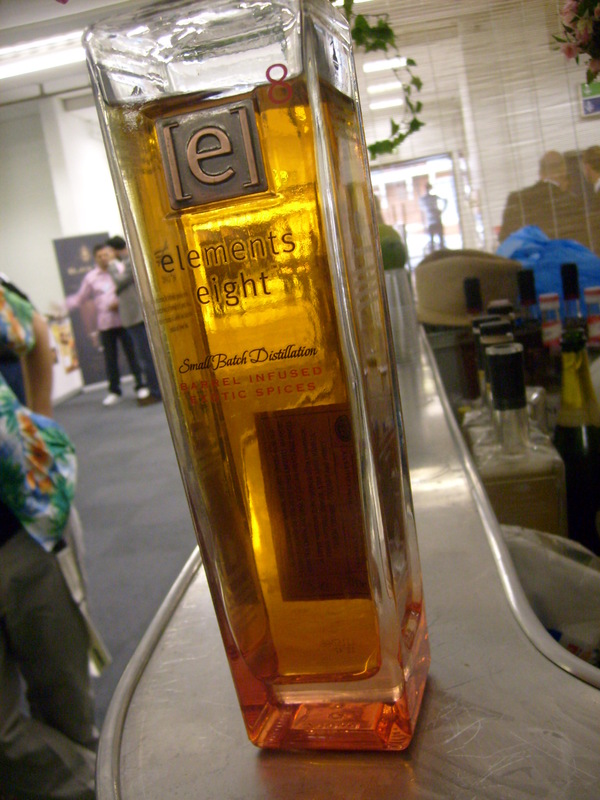 Also i finally got to try out Elements 8 Spiced, which i found to be quite tasty. Also there was sessions and masterclasses and the one´s i got a chance to attend first was the “Don`t Fear the Blender” with Beachbum Berry and then the El Dorado. The blender was first used in Havana in the Floridita, dating back to 1817 when it was first opened as “La Piña de Plata” – The Silver Pineapple in the place it still occupies, in the corner of Obispo and Monserrate streets. It got it´s name “El Florida” a 100 years later. The bartenders used to use 11 drinks shakers and you can just imagine the work…so when the blender appeared it was like a lifesaver and now it became easier to serve the never ending hords at Floridita. At the time the ice for the daiquiris was shaved. 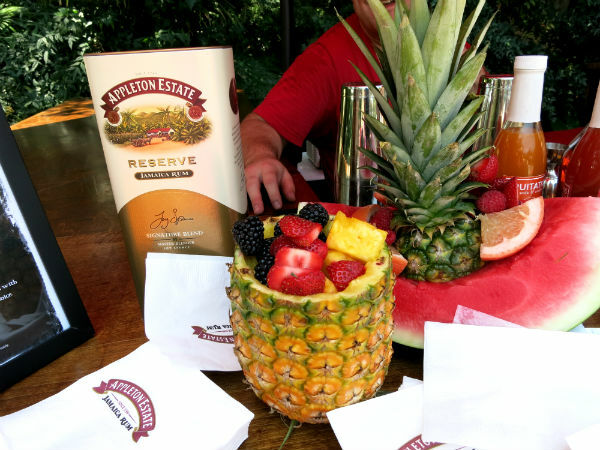 Then Don the Beachcomber started to use the Hamilton Beach blender and more would follow.The blender aerates and dillutes some of the crushed ice just enough to “wake-up” the spirit. Some drinks requires just a quick flash blending while other wants 15-30 sek. In the Bum´s books the exact time for the blending is always written out. Let the blender go for a long time, 20 sek. Fine strain into a bitter-sugar rimmed glass, gently pressing the liquids. Unsalted butter and honey in equal proportions, heated up to dissolve the honey and melt hte butter, leave to room temp before using it. 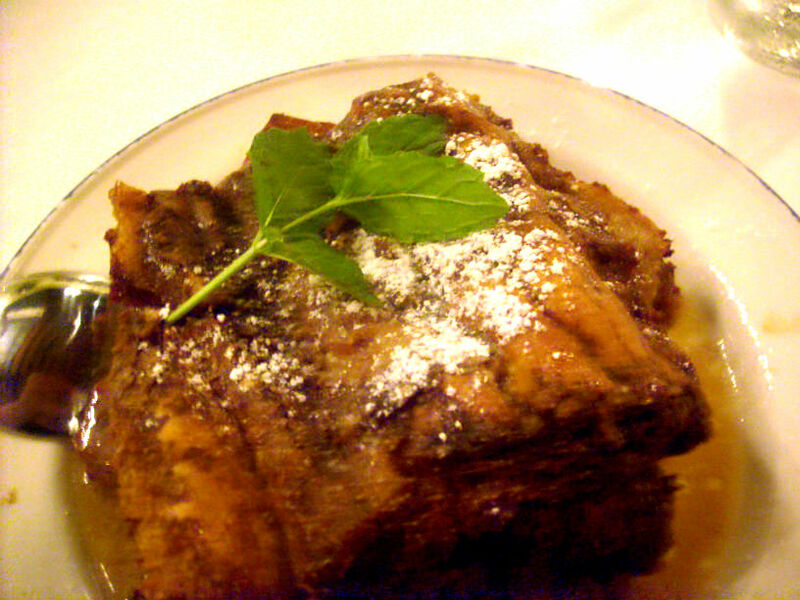 Also you can make a delicious honey-butter-cream by using sugar, butter, heavy cream and honey. 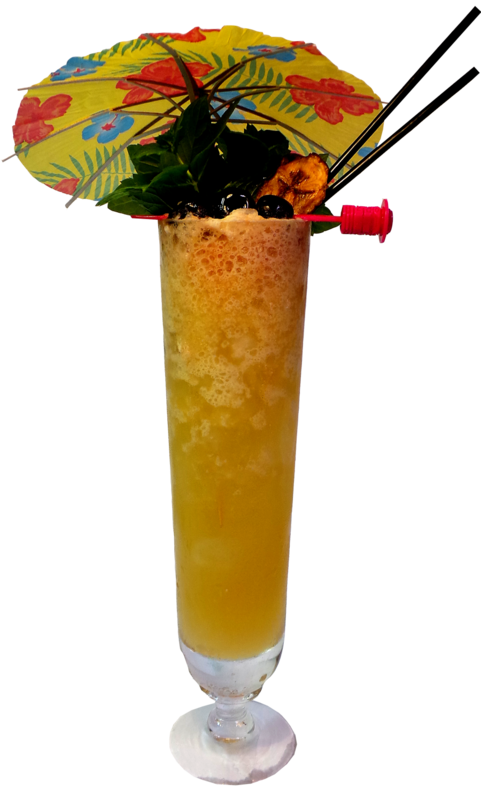 We also got some other nice drinks to imbibe like the always so tasty Missionary´s Downfall. 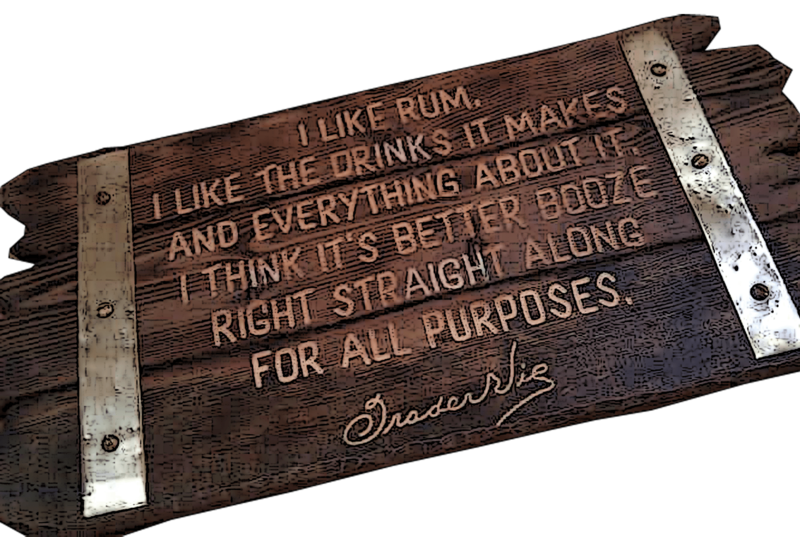 I don´t think i need to present what this rum is, if you don´t know already go read my earlier post and check their website. 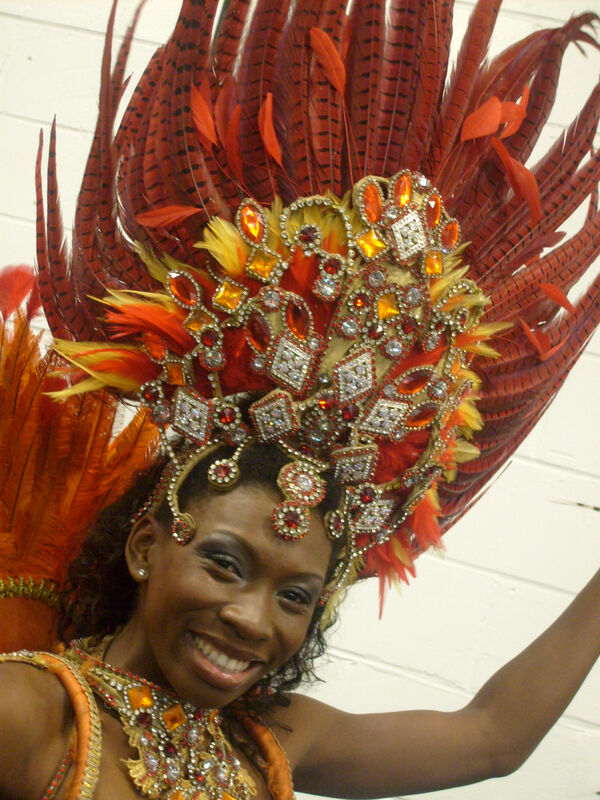 They took us through a journey to the land of many rivers, Guyana where the demerara rum is made. An interesting thing i learnt was that when the sugarcane fields are burnt a side effect is that the sugar in the cane is dissolved in the water that evaporates and thus makes the sugar content more concentrated and sweeter. The yeast is put in a molasses solution to get happy and multiply. Further they spoke about the different stills and since i`m a DDL still geek i always find that interesting. 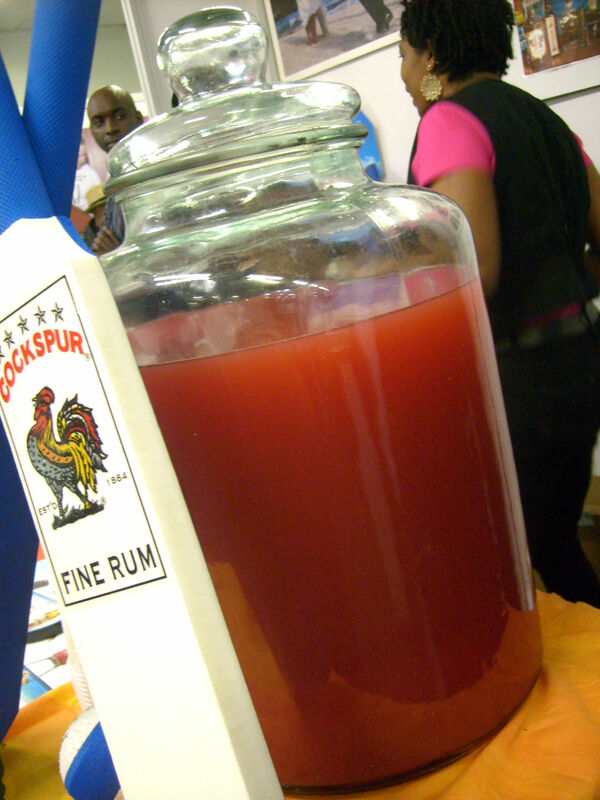 What DDL does is simply to put as much Guyana as possible into the rum..
SATURDAY AND SUNDAY – RUMFEST!! 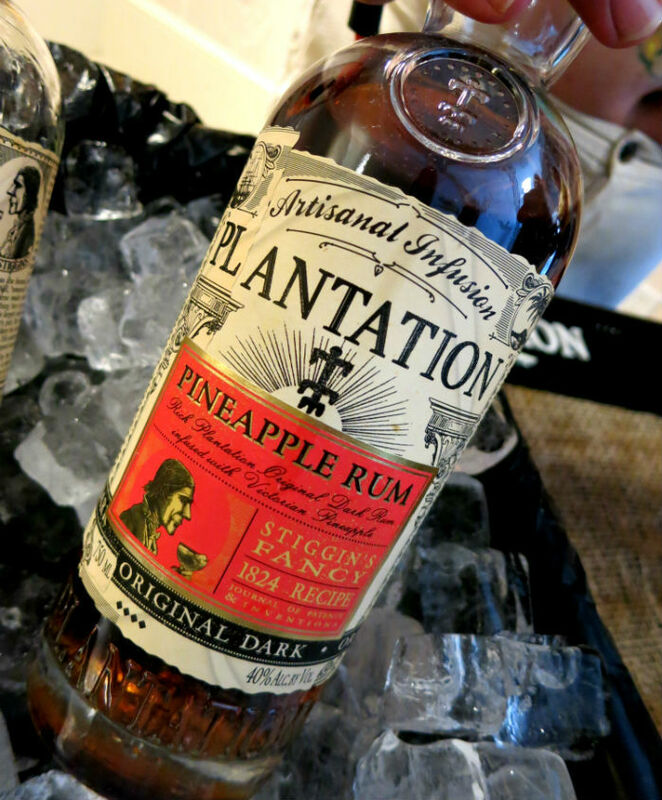 So saturday and sunday was the 2 days of Rumfest and these were 2 very intense days…rum tastings, cocktail and rum punches, tiki bartender of the year, sessions on rum, rum punch, rum, rum…and then the Golden Rum Barrel Awards. This blog was one of four nominated “Rum Blog of the Year (Europe) and i`m very honored and wanna thank everyone who did vote for me. It didn´t make it all the way though..the prize was given to my good friends Peter and Pauline over at the Floating Rum Shack, who i think really deserved it! There was also four nominated blogs for the USA cathegory and the winner was Rumconnection. All the awards you can read about at the bottom of this blog post. 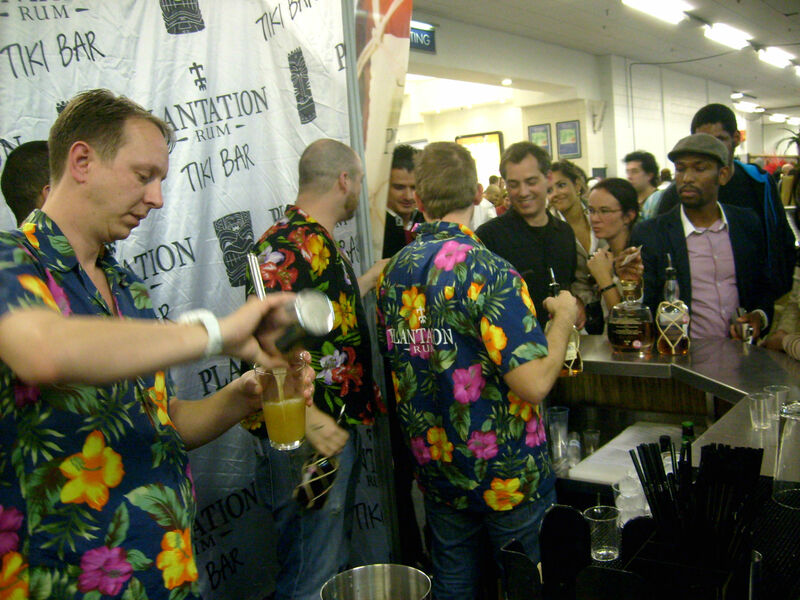 Also there was the Tiki Bartender of the Year contest with the final on the sunday. 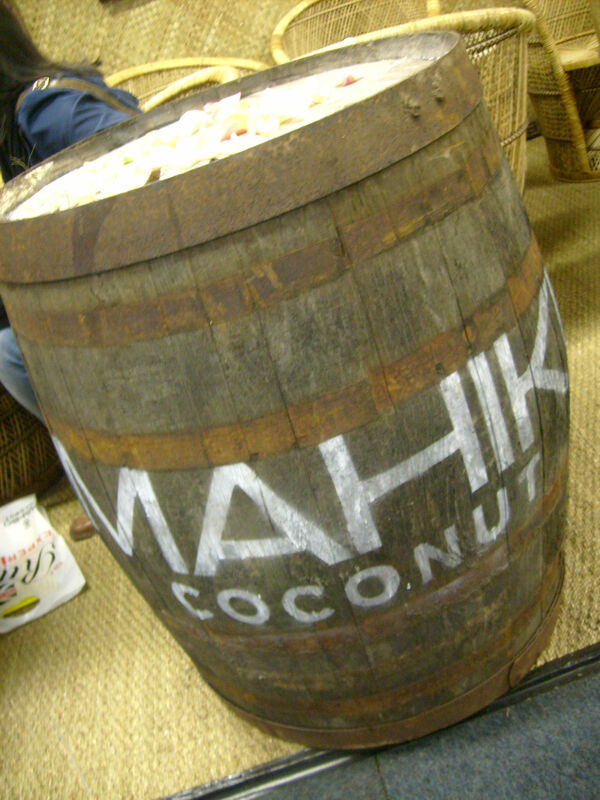 There was 3 bartenders in the final and the winner was Mahiki`s head bartender Georgi. 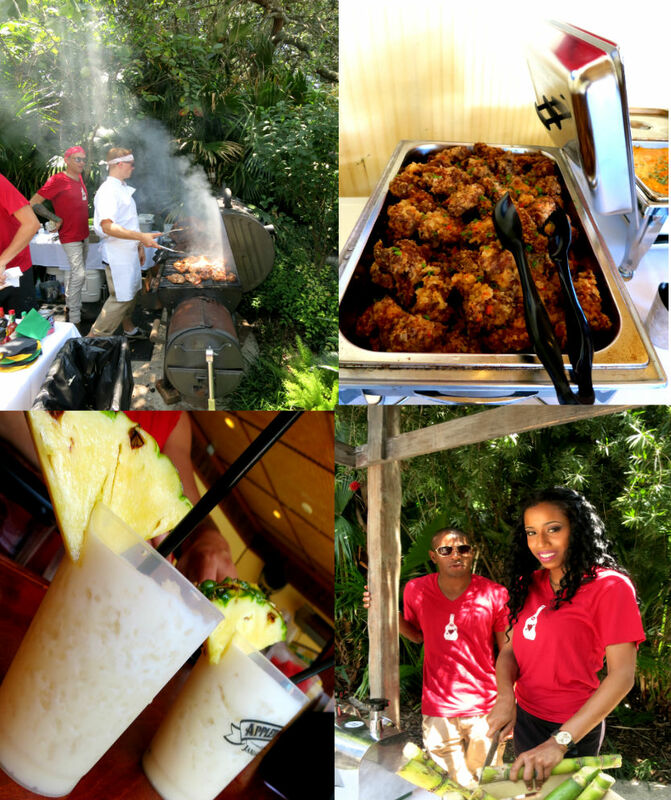 What i particularly like about the Rumfest is that it is such a people thing, it´s relaxed and laid back with that caribbean feel spiced with quite a bit of tiki vibes, an environment i feel right at home in. Yes there´s food too! 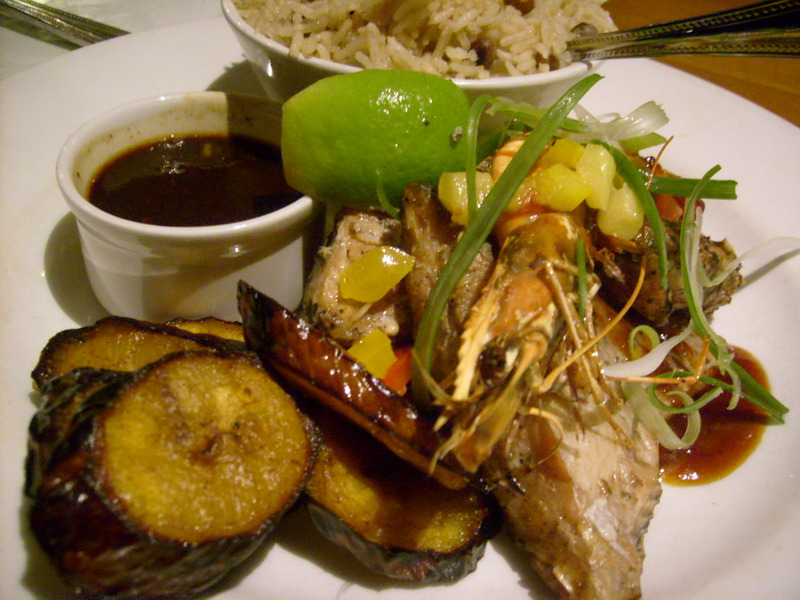 i did eat some real good Caribbean food at Ian`s restaurant Cotton´s – a place i really can recommend if you go to London! i had their famous Mixed Jerk Fish Grill – parrot fish, tilapia, snapper and tiger prawns served with fried plantain and rice & peas and it was lovely! 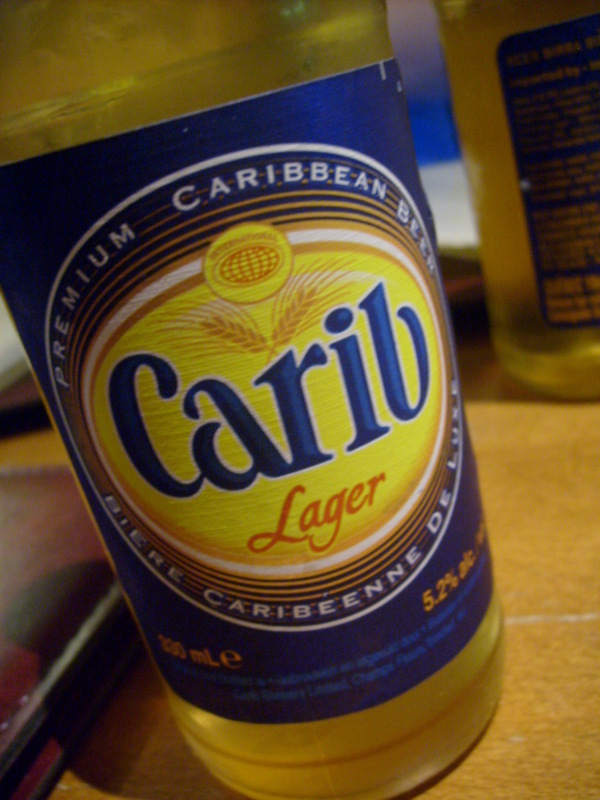 Washed down with cold Carib and Blue Marlin beers. 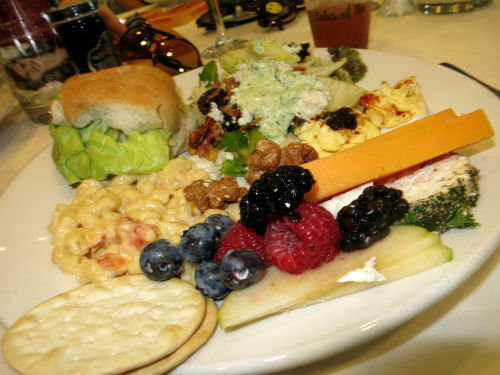 Also the awards dinner was an amazing experience – the Caribbean style dinner with the Butterscotch Pumpkin Soup with Goat Cheese and Spiced Pumpkin Seeds was really tasty. Three bars in London i would recommend are Trailer Happiness, Montgomery Place and Callooh Callay – you can´t go wrong with any of them and if you go Trailer you`ll most likely see Damien fire up the roof. The Zombie at Trailer Happiness. 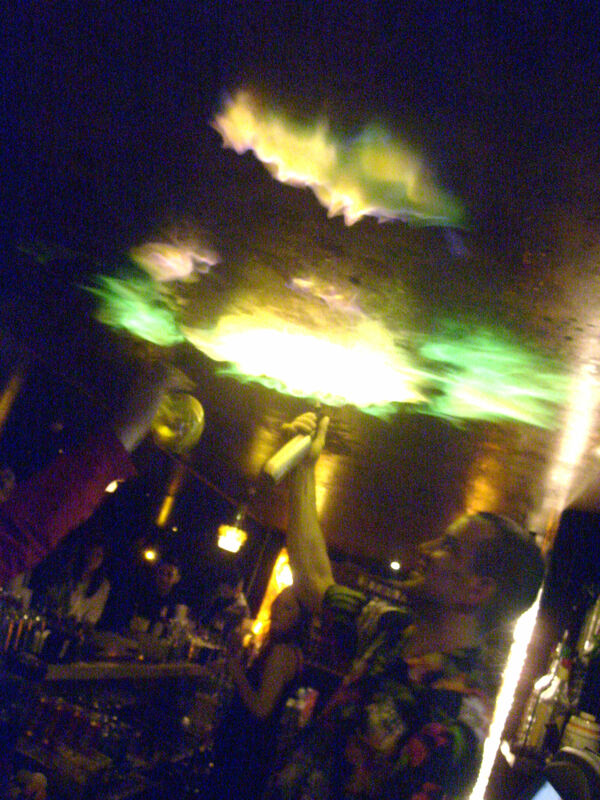 And their fire show…putting the overproof rum soaked copper roof on fire…displaying all kinda colors, awesome! 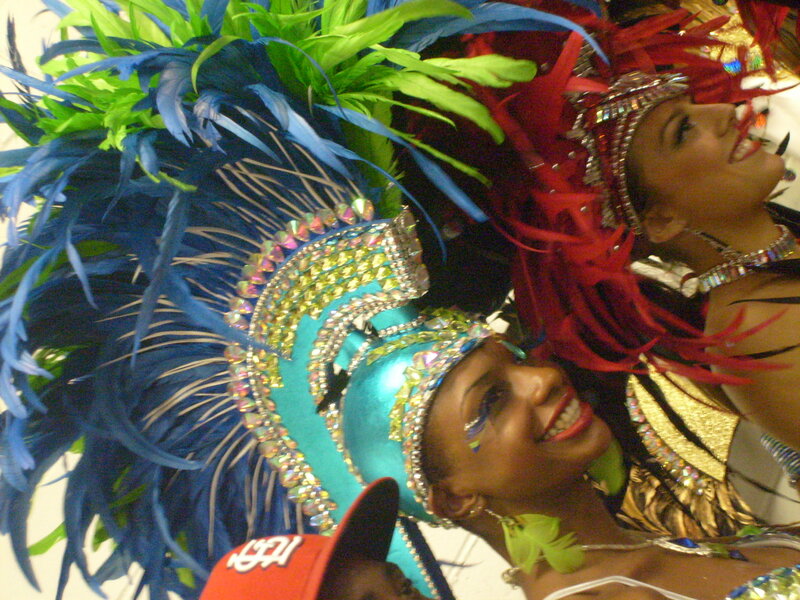 It`s caribbean carnival at the UK Rumfest! 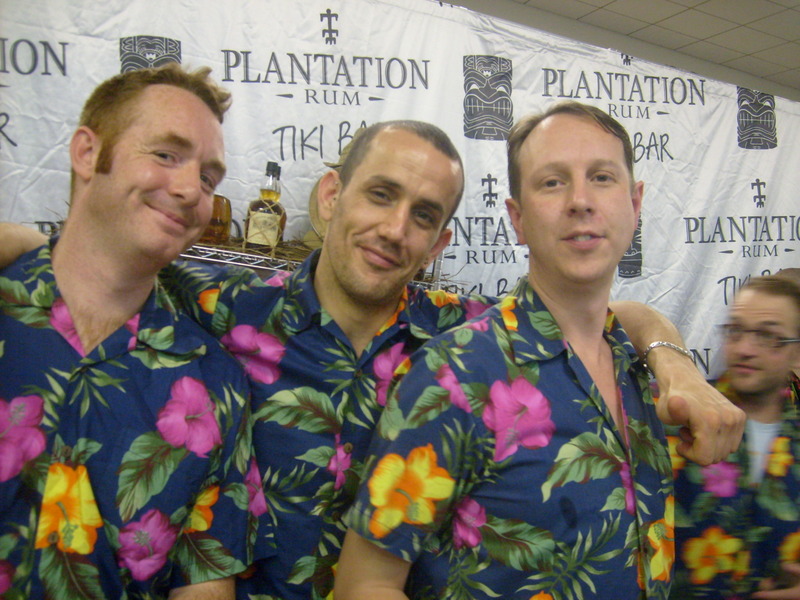 Three charming rum smiles in the Plantation stand..if you go to Trailer Happiness they´ll make tasty drinks for ya! Three happy rum people…(Stanislav Vadrna, Yours truly (Tiare) and Carl Kanto (chemist, distiller, El Dorado) i love this about events like this – the friends you meet both new and old. 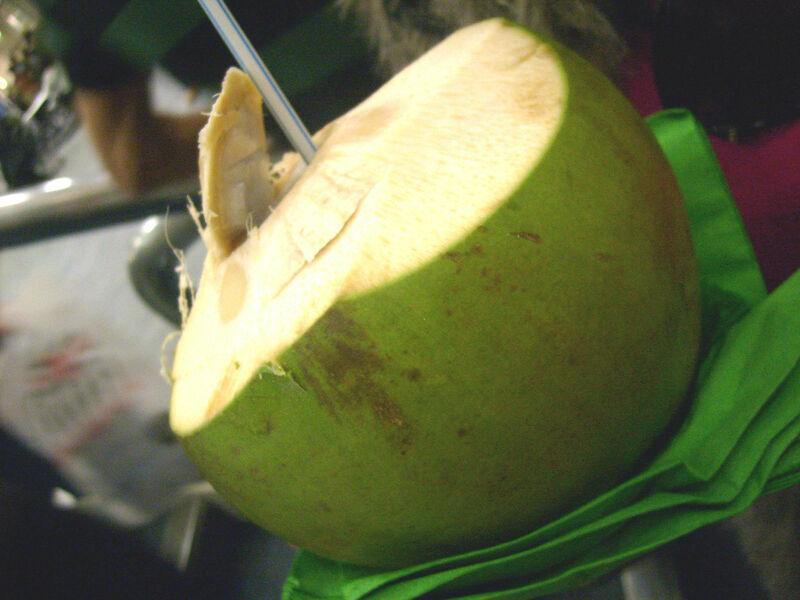 We could get fresh cut coconuts too…with rum in it! 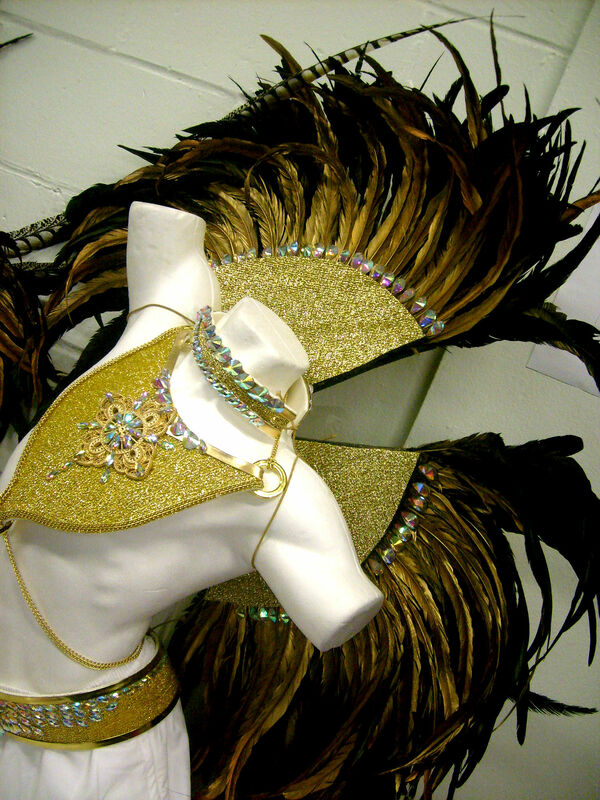 In the Rum Frat House – it´s like the Mixohouse in New Orleans but with rum lovers. 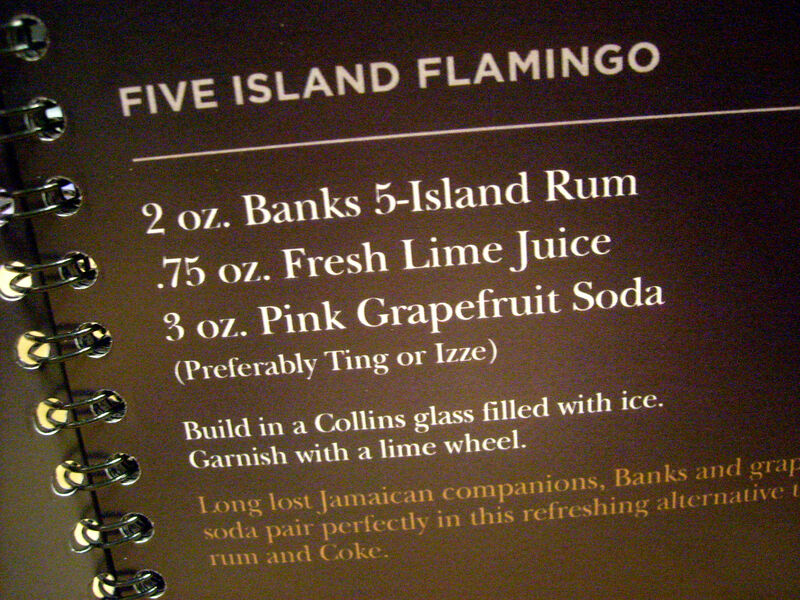 No Rumfest without Ting…and with Banks Five Island it`s wonderful. Like a lighter and smoother version (flavorwise) of the JWray overproof…but don`t let that deceive you – this rum is strong. 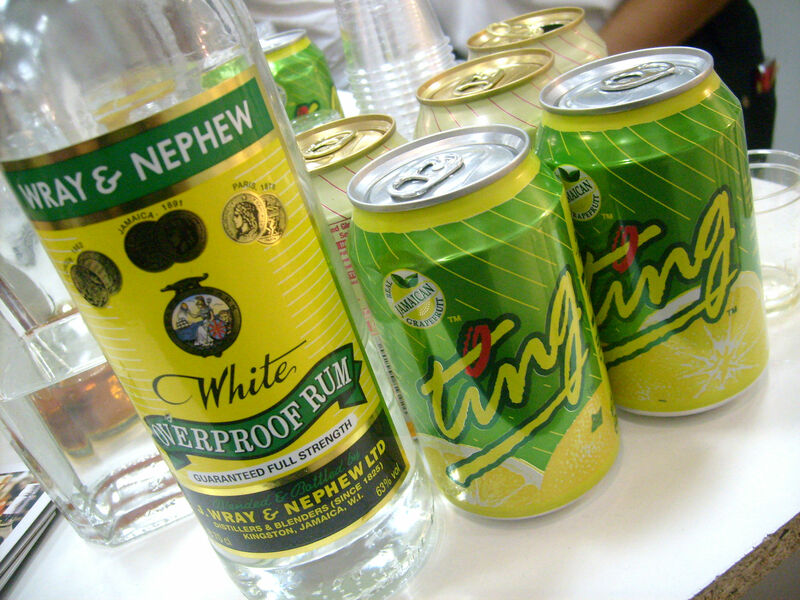 And here`s the original JWray and Ting! which was my corps reviver on the sunday…backed up with chocolate muffins. 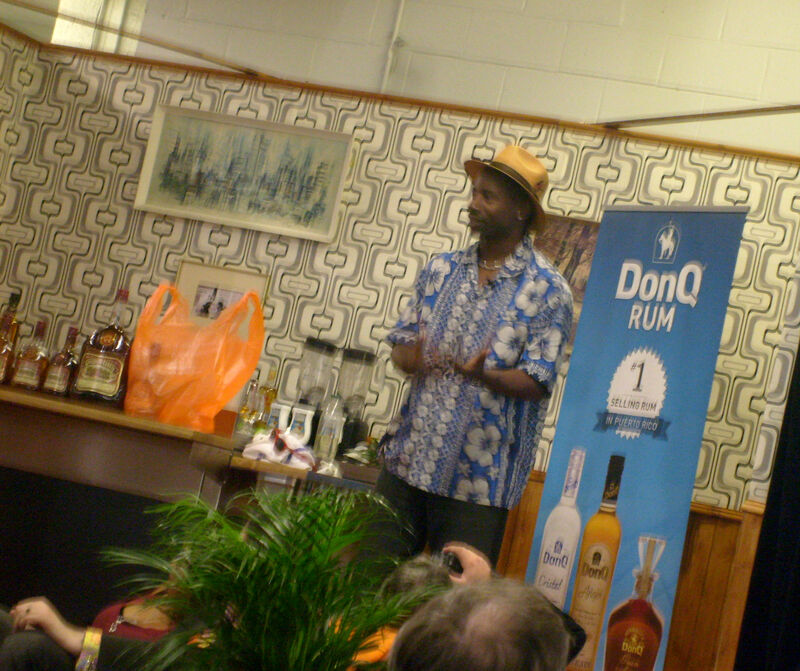 Ian Burrell – the one and only – Global Rum Ambassador and founder of the UK Rumfest. Joy Spence from Appleton Jamaica rum. The first female Rum master blender. 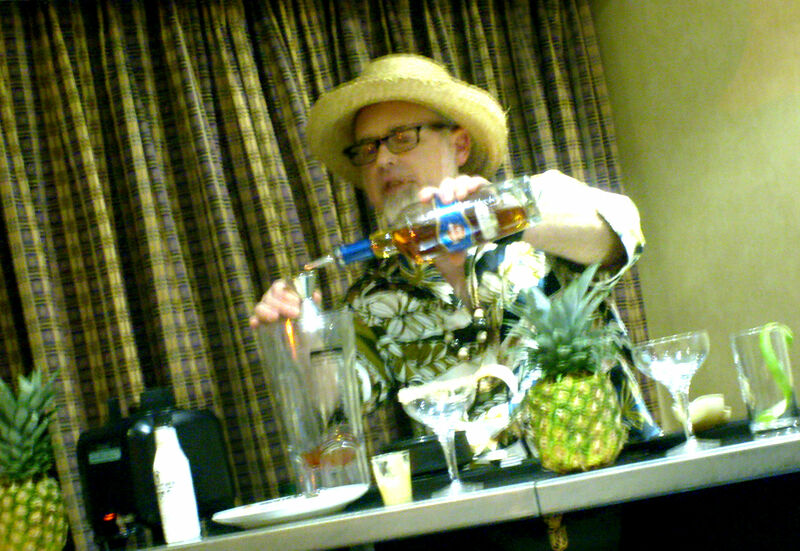 Ed Hamilton from the Ministry of rum. Founder of the pioneering web page and rum forum. I wanna raise a toast of El Dorado 15 Year Old rum for George Robinson, the head man at the Diamond Distillery in Guyana who passed away just a little while before the UK Rumfest. 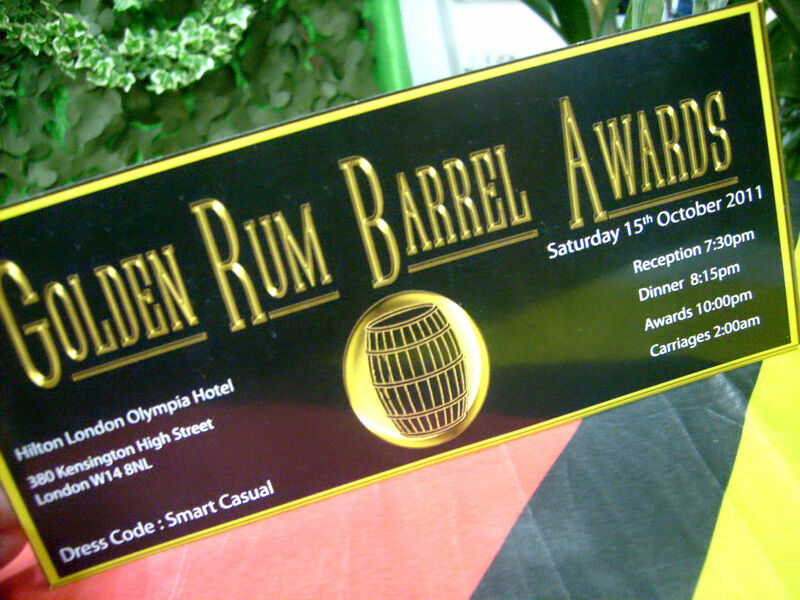 A toast was also held at the Golden Rum Barrel Awards. Can you have too much rum? This is a slightly belated post about food during Tales week..or really anytime! this is part two. Forget about your ordinary Poboy´s for a while..no matter how tasty they are…cuz i`m gonna present some killer one´s that i hope you`ll try when you get a chance, maybe next year at Tales? I saw two pics taken by Lauren (Fleurtygirl) of these gourmet poboy`s and the first one got me to seriously drool..and the 2nd pic blew me away. 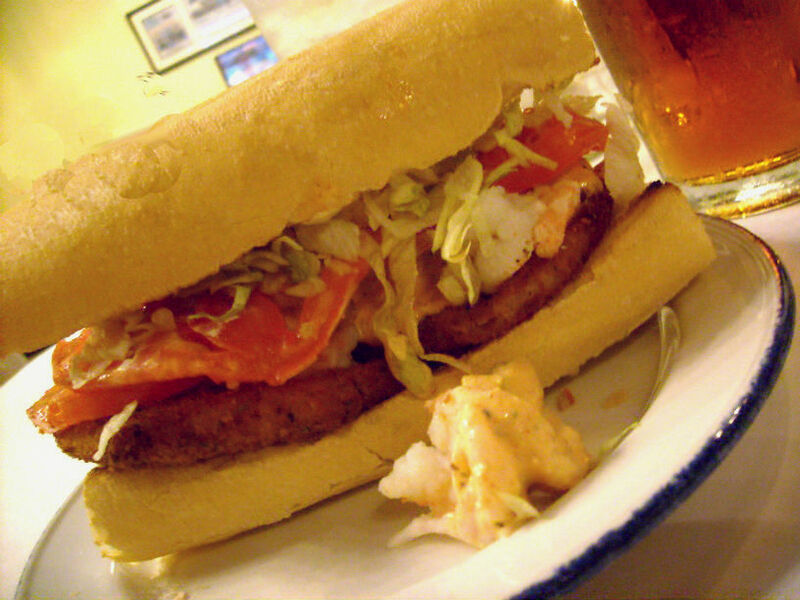 When i saw those pics i was happy that i was in Nola and not a thousand miles away from those sandwiches…i`m talking about the gourmet poboy´s at Ye Olde College Inn. 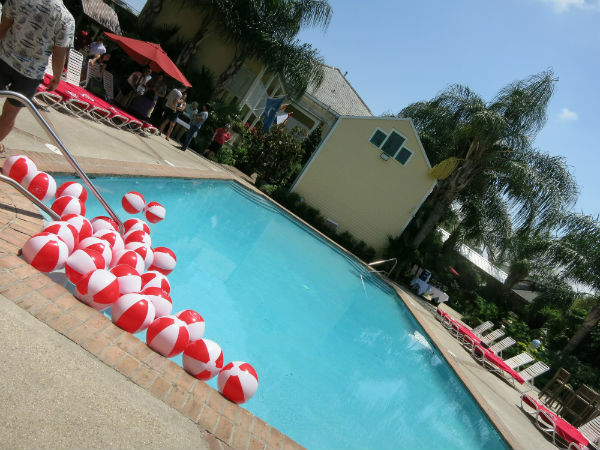 Ye Olde College Inn” is located on 3000 South Carrollton Avenue. They open at 4pm. They use fresh produce from the Fig Street Farm, Crescent City Farmers Market, the Hollygrove Market and Clayton Miller Produce. Locally grown seasonal fresh produce ensures fresh crisp and good quality food. I try to find fresh local produce if i can, wherever i am because nothing beats it and it´s always good to support local businesses. Well, i must say they are BIG – i only ordered a half loaf – and the pictures do not do them justice, not by a long shot. The bread is lightly toasted, it`s a lot that goes into your mouth so to me a half poboy was enough. But i also did order the award winning dessert Poboy – Fried bread pudding Poboy with Rum Sauce and it was droolingly delicious. The other Poboy was a fried green tomato shrimp remoulade poboy (award winning “Best Of Show”) quite a bit of creole mustard in the remoulade sauce and it was of course also delicious. My friend ordered a perfectly baked Baked Redfish topped with Louisiana Lump Crabmeat over herb roasted tri-color potatoes, asparagus & cherry tomato vinaigrette and it was of course tasty in a way food can be only in Nola..! Next time you go to Tales or just to Nola, try to stop by College Inn for some real good treats, maybe paired with something fun at the neighbouring Rock`n Bowl. You can also take the st Charles streetcar to get there, ride all the way to the end station at South Carrolton (it`s a scenic and enjoyable route) and then you walk a couple blocks until you see College Inn on your left side. But last but not the least..there´s another place to get real good poboy´s i need to mention and that is Parkway Bakery, want some REAL GOOD poboys? go to Parkway. You won`t be disappointed and you will return, i promise. 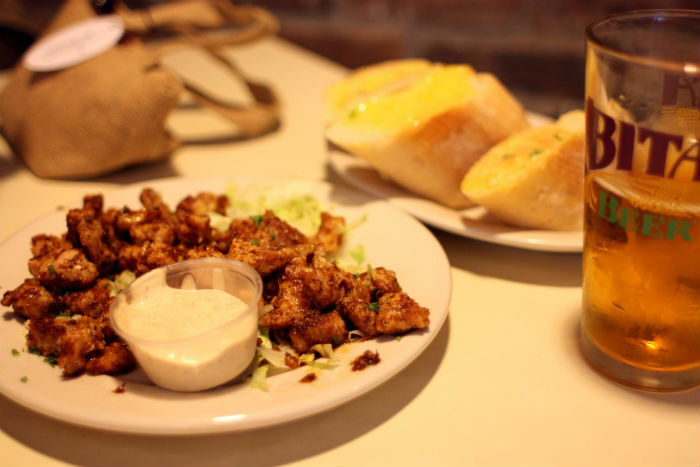 And last…but not the least – if you`re on Frenchmen and gets hungry there is of course places to eat and one of the good ones is Adolfo`s on the second floor above the Apple Barrel but also on the street you may see a couple selling wraps. That`s Sarah and Joe, they sell homemade wraps and the menu changes daily from barbeque to regular wraps and at a very good price, it´s tasty too and very welcome late at night when you come out of for example Dba. 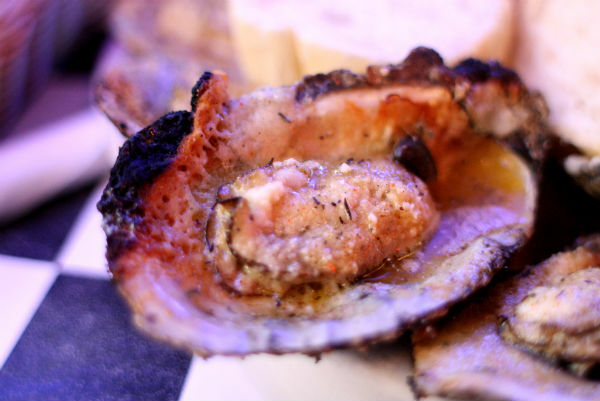 Charbroiled oysters and buttery garlicky cheeze sauce at Acme Oysterhouse. 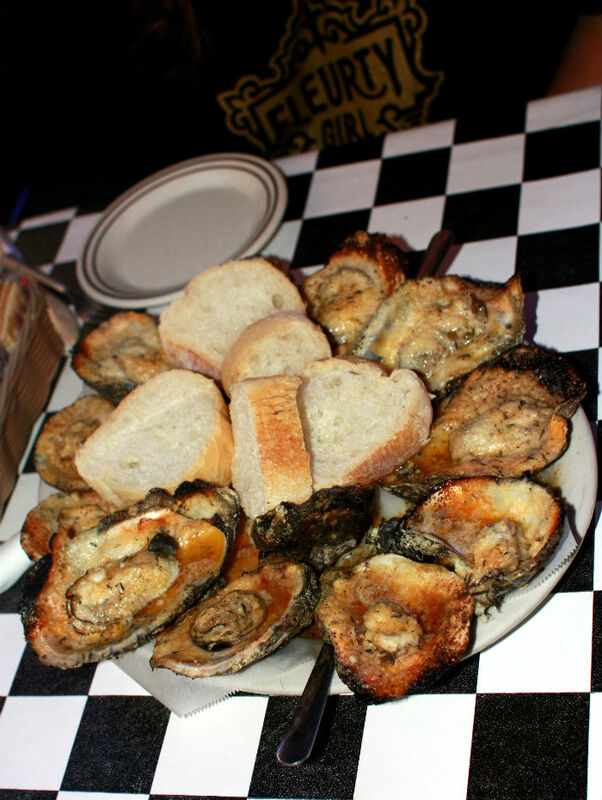 Opposite each other on Iberville st near Monteleone are two very good places for oysters, both on the half shell and charbroiled. The first one almost always has a long queue – Acme and the other is Felix`s. Well..there´s a reason why there´s almost always a queue outside that place. But the place on the other side, Felix`s – is also worth visiting and less queue. 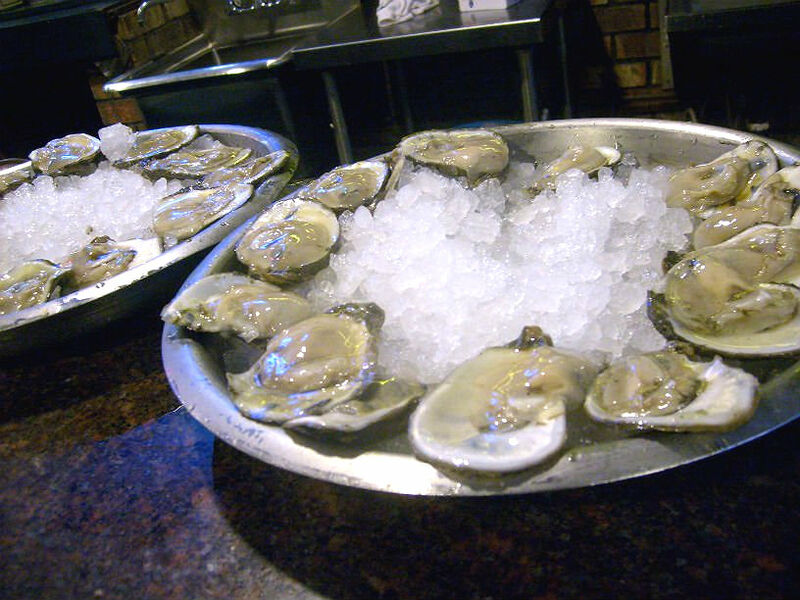 They have great oysters and their blackened gator is yum! Don`t be afraid of trying alligator, the meat is not dark red and weird as so many seems to believe, it´s more like chicken and it really is tasty in all forms from sausage on a stick or in a poboy to cheesecake a la Jaques-Imos or like this, Felix´s blackened gator. 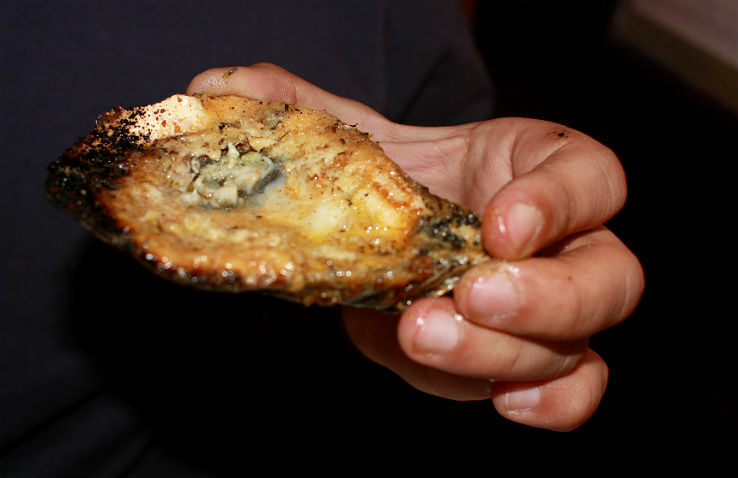 After all you´re in New Orleans, they know how to cook…so try things! Blackened Louisiana alligator at Felix´s. 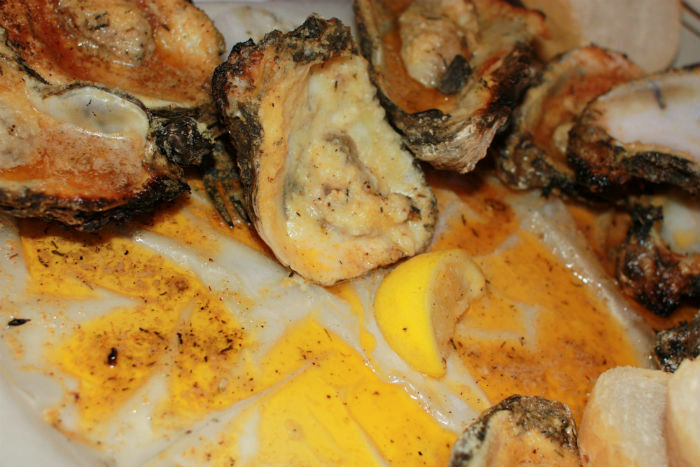 Many thanks to Tony Harion for the pictures of the blackened gator and the charbroiled oysters. 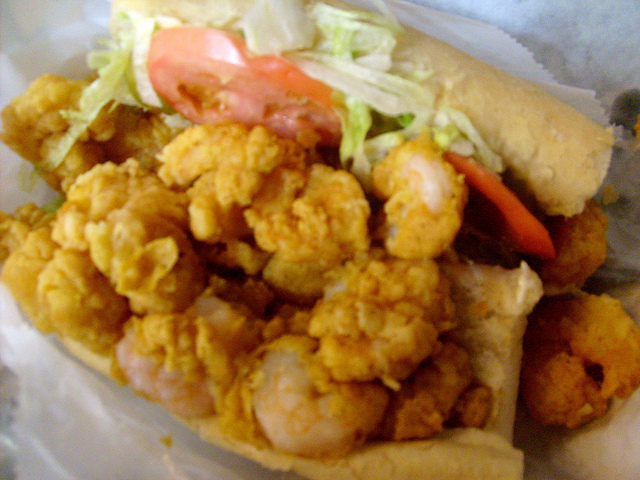 That was all from this year`s food adventure from me which this time was all about seafood and poboys. It was a while ago…i´ve missed a few…but its time for Mixology Monday again and hosting this monday is Chris from over at Spirited Remix. Give me the best drink recipe you’ve ever created. If you don’t have a drink that fits the above mold, then perhaps this is your excuse to revisit your old “original remixes”, as I call them, and decide or even tweak one to be your best. 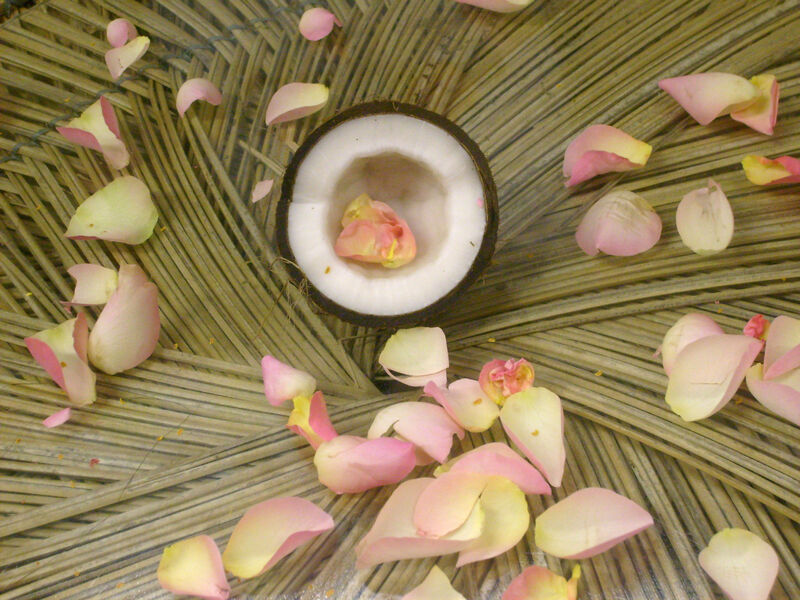 If you’ve never made such a drink before, then begin experimenting right now! For me there´s one particular drink i`m gonna use for this post, its a drink made long ago but its probably a remix since it was a twist i made and i don`t think its changed up enough to be an all original. Nevertheless it has been used over and over to quench my own thirst and others. It has been served at parties as well as at home. It has always been very well received and it has survived until now and will keep being alive. And it does have something very important in the list of ingredients – it has Ting. But the main reason i choose to post this one is simply because its damned tasty and it`s in regular rotation and always will be as long as i live. Top with Ting. Garnish with 2 pineapple leaves and a piece of pineapple. Believe me..this drink is worth the effort. Add in pot, heat and stir until it gets creamy. Add a splash JW&N overproof rum and stir again. You want a smooth creamy sauce. Keep a bit above room temp. The problem with honey cream mix is the milk solids from the butter that forms when the mix gets chilled. It may help to use clarified butter or to dry shake first (without ice) before shake over ice. Can also be made with just honey-mix (equal parts water and honey) if you wanna avoid the fuss with the butter. But the butter adds a silky buttery touch. 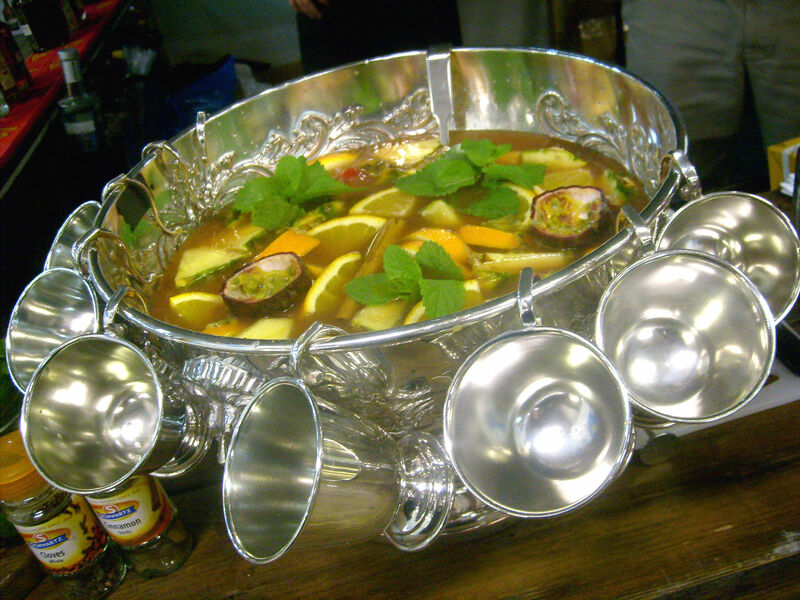 But when served in the pineapple as drinking vessel and filled up with crushed ice you won´t see much of the butter solids anyway. My first impression was – too tart. But of course, that also may depend very much on the limes you´re using but 1 oz is quite much of tart if no syrup is there to balance it out. Instead there´s 0.75 oz of Creme de Cassis and 0.25 oz Grand Marnier. I added a little bit of sugarcane syrup to see if it made the drink better and it did, at least to my palate. Well, this one – i have to say – is not one of my favorites from Grog Log. But friends, its drinkable, don´t get me wrong. Just pimp it up with some sugarcane syrup unless you like it tart. 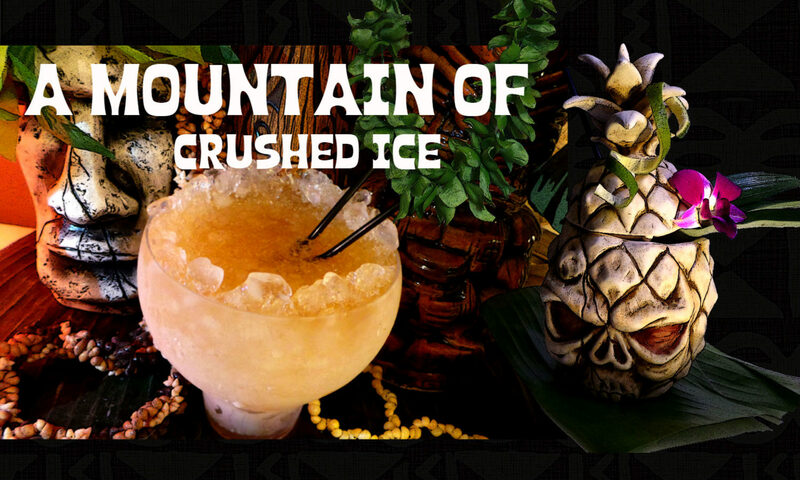 Shake and strain into a Tiki mug or glass with crushed ice. Quite tasty, the pineapple juice with the hibiscus syrup adds some freshness – and with Smith & Cross in the glass you can´t go wrong, really. It suits me just fine to have some Tiki drinks now just when the winter is trying to not let the spring come through and its not warm yet, so let the rum warm us instead. 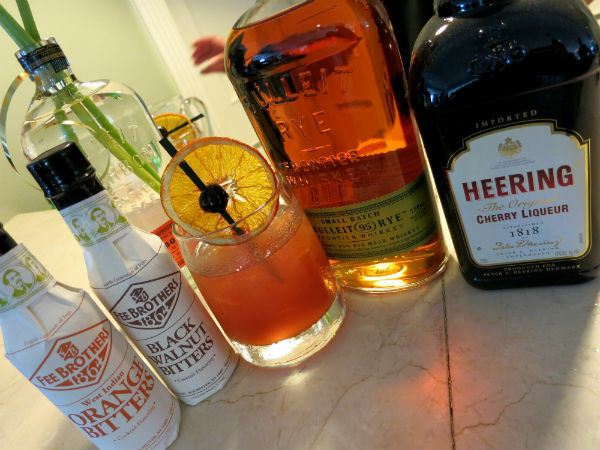 A real Hurricane Cocktail made with natural ingredients and not the chemical mix is a divine thing to the palate as we all know and have also written about. And so one day i got the chance to come up with a twist of this drink which will have to serve as an appetizer before the christmas holiday drinks that are on the way. Half fill a Hurricane or tall glass with crushed or cracked ice. Shake all ingredients and pour unstrained into the glass. 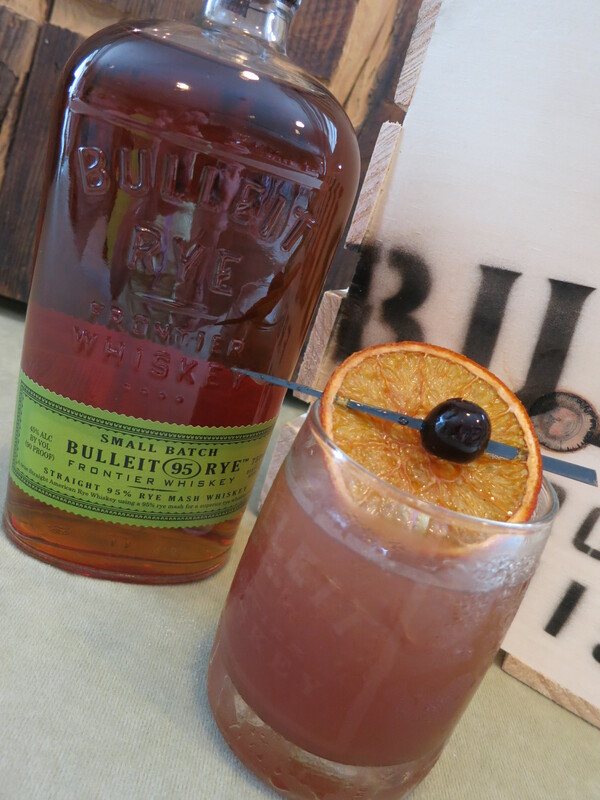 Fill up with more ice if needed and garnish with a lime slice, fresh mint and stemmed black cherries. That`s all folks, probably the shortest blog post ever from me..but like i said, its an appetizer.